Let’s talk about logos and/or any art submissions when coming down to custom orders. When it comes down to logos and/or artwork it’s always best to send them in .eps, .pdf, .ai, .psd, .tiff file types. There are some exceptions to the rule as such as a background design or a picture for a green screen. 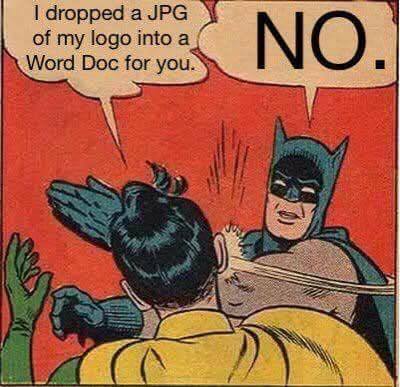 That’s the only time it’s ok to send a jpg or a png file. Doc files will only be accepted for text information purposes only. Why is it better to send it those file types? They have a transparent background. Why a jpg/jpeg isn’t a good file? They do not supply a transparent background. When extracting a logo from a jpg file the edges now become pixelated/fuzzy. Once it’s enlarged or shrunk on the canvas it can not be moved back without cutting out the logo again. Is a PNG file ok? It is the same thing as a jpeg. There is a chance that you or whomever sends the logo to you in a png file can save it out with a white background which in turns makes it useless. If you send it correctly (transparent background) we will accept it and move forward. Here comes the big NO NO! Never submit a logo in a word doc file. Our designers will email you back quickly and tell you that the order will be placed on hold until the correct file types are sent. Please help us make it super easy for us to make a perfect product for you!